Share a scanner over the network just like you share a printer! With fully networked operation and automatic document feeder support, Scanique greatly improves productivity and makes your life easier. Scanique can share most TWAIN and WIA compatible scanners, even if they are not equipped with a network interface, and supports local and remote scanning. With Scanique, you can scan documents into a wide range of image formats, including the ability to scan directly into multi-page PDF files. Basic rotation and editing support make post-processing easy. While sharing a printer over the network is fairly easy, Windows comes with no built-in facilities to share scanners over the network. Scanique turns any scanner into a network scanner. Share it like you share a printer! No need to install separate server and client parts; each copy of Scanique can work as a client or as a server, switching instantly between the roles as needed. Scanique allows all the networked computers to use the scanner with full support for scanner's advanced features such as automatic document feeder. Why would you want to share a scanner? The answer is convenience. It's the convenience of having your document's scanned image go directly to your computer without the need to scan a file on one PC and send the resulting file over to yours. The convenience of using auto document feeder equipped scanners in the background and getting the result as soon as the job is complete. The convenience of having direct access to equipment without having to ask your co-workers to share their PC. Indonesian Windows remote process viewer that shows detailed information about the Windows processes on remote computers and related information from www.filecheck.web.id. RemShutdown allows remotely shutdown or restart network computers. You can specify a delay during which a message you specify can be displayed and applications running on the remote computer at the time of shutdown can be allowed to close. Italian Windows remote process viewer that shows detailed information about the Windows processes on remote computers and related information from www.file.net/it. What a freedom for remote access or traveling users. With SBSCC TSspeedbooster, you can make any windows application a web-based application. Simple Cloud solution for your company. A user-friendly, yet powerful Telnet Server that runs on Windows systems. The command library is built on 'plug-in' DLLs, so it is easy to add new commands to the server when they come out. PlanetRemote is a complete software package that allows you to take control of your PC and access your files remotely as if you were sitting right in front of it! You can control your PC using a web browser or using the included PlanetRemote Viewer. HTB Remote Backup Lite Software is a simple but powerful tool to automatically schedule your backups and do the restoration on demand. 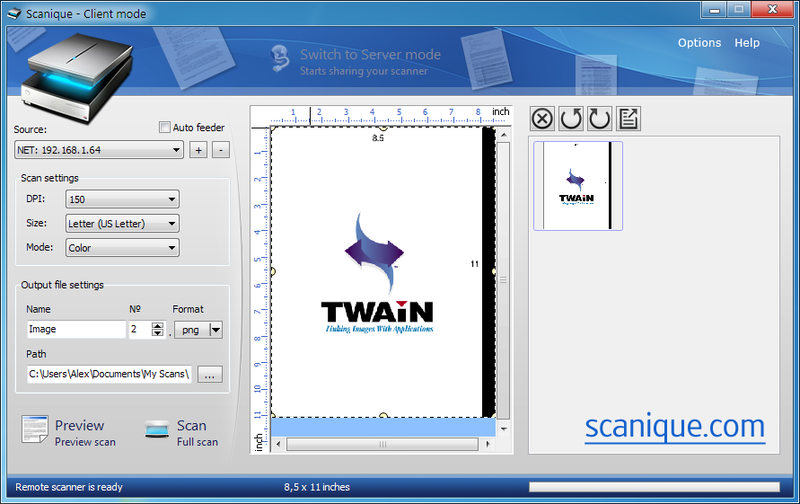 Scan Redirector RDP Edition is easy to use software, which allows scanning from your locally attached scanner in a Remote Desktop session.Both TWAIN and WIA scanners are supported. A great solution for VDI and Terminal Services! Easy to use program designed to monitor remote computers in the network, as well as on the Internet. Manage, audit and help servers and workstations from your local computer. No need to install any software on the remote computer and does not leave any traces there. Particularly useful for accessing remote machines without any previous preparation. This site does not contain serial number, crack, keygen Scanique serial number : serial number is the simplest type of crack. A serial number(cdkey,product key,etc) is register the program as you may already know. a crack or keygen may contain harmful software. If you cannot find the exact version you want, just give it a try. for more information read .nfo/.txt/.diz file include in zipped file.